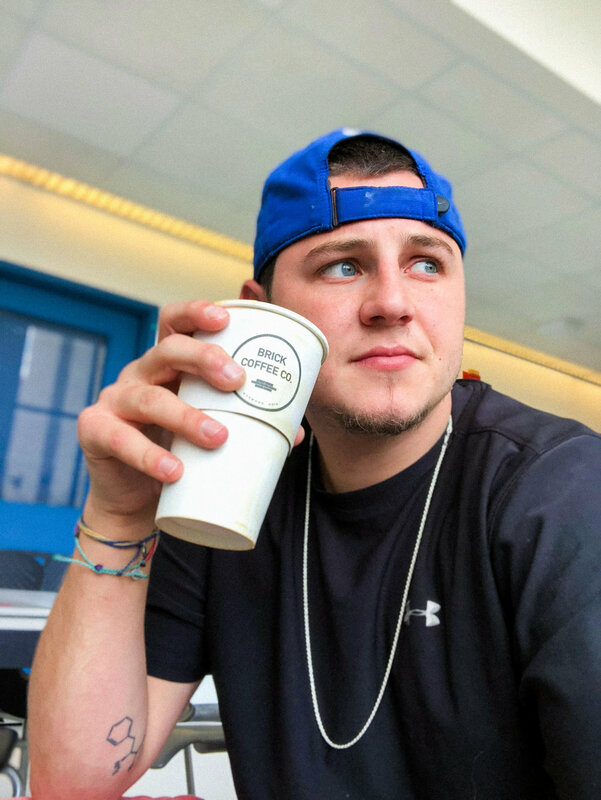 Growing up, I remember my dad always drinking black Folgers coffee – I used to think drinking black coffee was the epitome of masculinity and now here I am posting a selfie of me drinking black coffee lol (toxic masculinity is bad; being a man means being in tune with your emotions! who cares if men take selfies!) – and my mom getting the super sweet Milky Way from Jet Coffee (she now gets a Starbucks Venti Iced Chai Tea with 13 pumps of chai and 1 pump vanilla if you want to surprise her). Until college, I never drank any coffee and then my freshman year, I finally conditioned myself to drink it with hazelnut creamer and sugar. My sophomore year, I decided I didn't want the extra calories and sugar so I quit cold turkey and switched to black coffee. I mostly drink black coffee now, but I'll have a Pumpkin Spiced Latte (a hill I'm willing to die on: pumpkin-flavored things are Very Good and I'm starting to get excited for fall already) or Salted Caramel Mocha once in a while because I'm very basic. I don’t believe I’m that unique though (maybe I am in the sheer amount of caffeine I drink): about 90% of Americans drink caffeine in some form. Americans are drinking coffee at a rate higher than it has been in 6 years, and probably ever. If I had to guess, I'd bet that it's due to the commercialization of coffee by Starbucks, Dunkin' Donuts, and Keurig (pops thought that I should make this point). Caffeine is a drug and saying I’m addicted is definitely not a joke; I get withdrawal headaches if I don’t drink caffeine. So understanding how caffeine affects the body and why it’s so addicting is interesting to me and has real-world implications. Let’s talk some science! Like nicotine, caffeine is a psychoactive addictive drug part – in fact, caffeine is the world’s most popular drug – of a drug class called stimulants. Stimulants increase the activity of the central nervous system. (Quick little side note on the word “drug.” Since we usually use the word to describe substances like heroin, cocaine, or meth which are harmful, the word “drug” seems to carry a negative connotation. But the word drug just means any “chemical substance used…to enhance physical or mental well-being.” I use this term when describing the medications I take for cystic fibrosis care. It doesn’t have to mean something negative, though it often does. I digress.) This increase in central nervous system activity is what accounts for that improved focus, increased motivation, and jittery feeling that most of us associate with drinking coffee. It’s why I love coffee so much. I’d be remiss if I didn’t admit that if I’m not careful, it can also trigger my anxiety and make me feel worse, but man, I love coffee so much. To get a more in-depth idea of how else caffeine affects the body, take a glance at this page: Caffeine Effects on Your Body. Biologist Neal Smatresk from the University of Texas at Arlington very elegantly describes how caffeine affects the body in this article for Scientific American. It's a biiiit more complicated than I'd like for those without much of a biology background, so I went ahead and summed it up in the three bullet points below. Essentially, caffeine itself isn’t what directly causes those physiologic effects that we feel, but it is indirectly responsible. Caffeine simply blocks the activity of a different compound – phosphodiesterase. Phosphodiesterase is the compound responsible for breaking down another compound – cyclic adenosine monophosphate, typically abbreviated as cAMP. Since caffeine blocks phosphodiesterase, the breakdown of cAMP is prevented. The effects of cAMP are then, as Smatresk explained, prolonged. cAMP is responsible for triggering the chemical cascade that leads to the production of noradrenaline and epinephrine – the neurotransmitters associated with the physiological fight-or-flight response. Since cAMP’s activity is prolonged, the activity of noradrenaline and epinephrine is amplified, which in turn affects the heart. This is where that heightened sense of feeling comes from. The heart is literally pumping harder and faster, increasing blood pressure and delivering more oxygen to the brain and other tissues, which is why we feel the way we do when we ingest caffeine. Caffeine is addictive because it actually transforms the way your brain is wired when it is consumed daily (this is less scary than it sounds: the principle of neuroplasticity describes how our brains are constantly being rewired. This is the concept behind “muscle memory.” Whenever we do things continuously, the neural pathways become hardwired, which causes them to become second nature. This can be utilized to form positive habits as well.) The concept of addiction is similar in that our brain comes to need that caffeine surge, which affects how it produces other chemical neurotransmitters. The more caffeine we consume, the more we need to ingest to reach that feeling we want; this is what’s called building a tolerance. While caffeine is addicting, it’s fortunately much easier to break our addiction to caffeine than other drugs, like heroin, cocaine, or nicotine. I'm compelled to note here that this should give you an idea of how incredibly difficult it is to break an addiction to substances. If you've ever derided somebody for being addicted to alcohol, nicotine, heroin, painkillers, or any substance more potent than caffeine, take a second to imagine completely eliminating caffeine from your life. It's hard to imagine for most people; now try to imagine a substance far more addicting. Breaking an addiction is unfathomably difficult for most people. I'll write a piece about our opioid addiction epidemic at some point in the future. It feels like every time I log onto Facebook, I see somebody share an article where a purported study shows caffeine increases or decreases your risk for cancer or some other disease. I won’t digress into an essay on how often incorrect information is widely shared on social media or how people read too much into small, often misleading studies that most likely don’t really show what they’re claiming they show. But as of now, the evidence is pretty well settled that caffeine is safe and doesn’t increase your risk of osteoporosis or cancer. There needs to be more evidence to determine if there is a link between cardiovascular disease and caffeine, but if you have no present heart problems, you’re probably okay to consume caffeine. To say there are no health benefits to caffeine is probably incorrect, though. It certainly isn’t necessary to a balanced diet, but the benefits of improved alertness and energy are subjectively beneficial. According to WebMD, there have been a few studies that have shown that caffeine may reduce the risk of Parkinson’s, liver disease, colorectal cancer, type 2 diabetes, and dementia. There need to be more studies to determine both the benefits and risks of ingesting caffeine. Unless you’re drinking insane amounts of caffeine (I probably should be careful), caffeine is certainly safe. I will put a disclaimer, just like Villanova: it’s potentially very dangerous to ever mix energy drinks with alcohol. whoa! is someone taking a portrait mode picture of me drinking Brick Coffee Co. while showing off my tattoo? i didn't even notice! Caffeine is a psychoactive drug that most Americans ingest on a daily basis. Just because it’s addictive and psychoactive doesn’t necessarily mean that it’s a bad thing, just that it affects our bodies in a physiological and mental way. It’s mostly safe if you’re ingesting small enough amounts, which most Americans are, and it’s certainly a good performance enhancer if used appropriately. It works by blocking the compound that inhibits the production of the fight-or-flight neurotransmitters, which is what leads to the increased heart rate, increased blood pressure, increased focus, improved mental state, and jittery feeling. I love love love coffee and energy drinks and caffeine so much, so relearning how it affects our bodies was very interesting to me. I hope this piece was interesting and clear for you to read. I enjoyed this piece and I think the layout is an improvement over last week’s. Next week, I’m deciding between GMOs, climate change, or something else that randomly piques my interest by then. Please let me know if there’s something you want me to talk about! Feedback is so important to me! Thanks for reading and please share!